Extreme Whey 2.2kg contains a full spectrum of amino acids and is particularly high in Branch Chain Amino Acids (BCAA’s) and glutamine, the most abundant amino acid found in muscle making up 65% of skeletal muscle tissue. 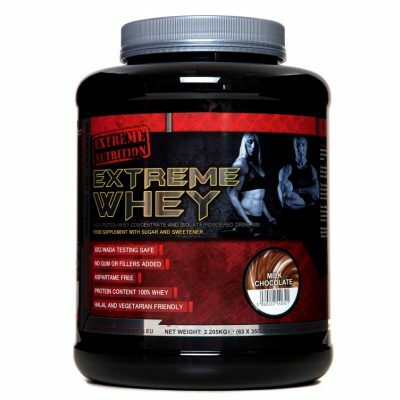 Extreme Whey 2.2kg is a blend of cold processed microfiltered whey concentrate and whey isolate, it is easy to drink and easy to digest, all Extreme Nutrition products are tested by our staff and athletes prior to them going on sale and some of those people conducting the tests have food intolerances and digestive issues. Extreme Whey 2.2kg also supplies biological fractions found in whey like Glycomacropeptide, Immunoglobulin, Lactoferrin and Lactoperoxidase and is Aspartame free with no thickeners or emulsifiers like Soy Lecithin or Xantham/Guar gum. Our products are made as cleanly and simply as possible.